This is the favorite Yule Lad of most Icelanders.. Stúfur! The name means Shorty in Icelandic. Stúfur is the Hiccup of the Yule Lads, the acknowledged runt of the litter. He is the smallest and stubbiest of the Yule Lads in form. However, his troll and elf ancestry have also made him very strong. He may be small and not too powerful in appearance but, in reality, he can really beat up anyone he chooses. He can even knock out a Monstrous Nightmare better than Stoick can. In his sleep while chewing gum. 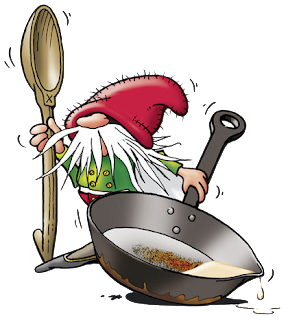 But the great irony is that the miniature warrior... that tiny Beowulf of a Yule Lad... is on a great quest to steal... uh... grease spattered frying pans. It certainly is a weird hobby. Stúfur has a harder journey than the other Yule Lads. His little legs have to work harder. He often is covered by snow as he journeys to the villages and has to use a telescope poked up through the snow so he knows where is going. And he has to beat up all the dragons and Vikings he meets along the way. And the reason Stúfur beats the odds and steals those frying pans? Well, it is because he likes to lick off the grease and drippings that are left in the frying pan. It's rather humbling when you think about it... all that tough journeying and fighting to lick off a bit of bacon fat? There is a parable in there for sure. But it's kind of a weird one. Anyway, if you fry up anything on Dec. 14 and through Dec. 27, just don't be surprised if your frying pan disappears moments after you set it aside. It's Stúfur style recycling! When he could do so. To a pan here and there.